Purchase this product now and earn 4,000 Reward Points! Like other fatty fish, salmon contain an abundance of omega-3 fatty acids. 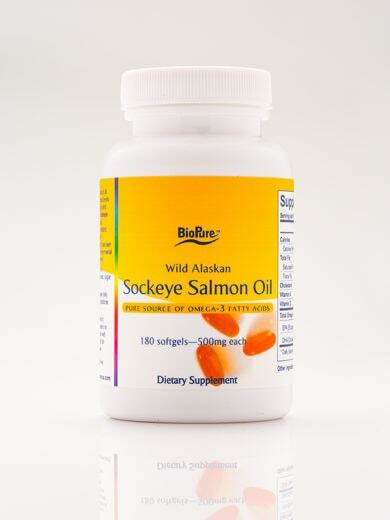 Gain the benefits of salmon every day with BioPure’s convenient Sockeye Salmon Oil Softgels. 180 softgles per bottle; 500 mg per softgel. The health benefits of fish oil have gained a lot of attention in the last several decades. We now understand that the oil is an excellent source of omega-3 fatty acids as well as minerals, and vitamins A and D3. The omega-3 fatty acids in fish oil are eicosapentaenoic acid (EPA) and docosahexaenoic acid (DHA) 1, 2. They are also known as “essential” fatty acids because they are essential to healthy-functioning humans and animals, and our bodies are unable to efficiently synthesize them, so we need to get them from the foods or supplements we ingest. 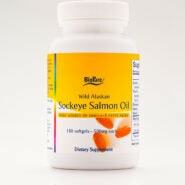 Our Salmon Oil is sourced only from wild (not farm-raised) Alaskan Salmon. Contains no artificial preservatives, color, dairy, starch, wheat, yeast, sugar, or soy. Anti-inflammatory and cardiovascular and other diseases: It is understood that there is a strong connection between cardiovascular disease and inflammation4. Omega-3 fatty acids play important roles in cell membranes throughout our body, many of which regulate and reduce reactions that contribute to inflammation2,5,6. The American Heart Association recommends eating fatty fish at least twice a week7. Supplementing ones diet with fish oil may support the body in slowing atherosclerosis6, decrease the risk of arrhythmias and heart attack8, and decrease triglyceride levels5,6. Fish oil supplements may show beneficial effects against other diseases associated with inflammation such as cystic fibrosis9and rheumatoid arthritis10. Mental health, anxiety and depression: Since the brain is made up of about 80% lipids and nervous system functions depend on essential fatty acids11 many scientists are investigating how the omega-3 fatty acids in fish oil may support the body in preventing or treating mental health conditions such as depression12, anxiety13, bipolar14and unipolar15 disorders, and Alzheimer’s16 disease. Cancer: The important roles that omega-3 fatty acids play in cell membrane activities may contribute a protective effect in relation to cancer risk. Fish oil supplements show some promise as a beneficial enhancement to conventional cancer treatments17, 18,19. BioPure Healing Products sells a fish oil supplement made from specific parts of wild sockeye salmon. Sockeye salmon is a preferred source for many reasons. First, it has a high content of oil rich in omega-3 fatty acids. Second, sockeye salmon feed on zooplankton and microalgae which places them low on the food chain and ensures their oil is not contaminated with bioaccumulated toxins. Third, these salmon are harvested far from sources of pollution in pristine, nutrient-rich waters of Alaska and the Pacific Northwest. Fourth, many companies selling fish oil use high heat to extract the oil, and chemical solvents to further refine and remove impurities. These processes can denature the nutrients present in the natural oil, devitalize its nutritional value and introduce potential toxins. BioPure Healing Products’ salmon oil is clean enough to eliminate the need for chemical refinement, resulting in a pure and natural oil with its full nutritional value unspoiled. Fifth, our gelatin capsules are gluten-free and contain no artificial preservatives, color, dairy, starch, yeast, sugar or soy. Sixth, Astaxanthin is a powerful antioxidant that naturally occurs in sockeye salmon oil. It is what gives the oil its reddish color, and aside from the antioxidating health benefits for you, it also serves as a built-in natural preservative, helping to protect the capsulized oil from oxidative damage. Finally, BioPure Healing Products’ salmon oil undergoes regular testing and is certified by NSF International for its purity and potency. Please Note: Do not take this product if you have a history of diabetes, immune disorders, cardiac conditions, or 2 weeks prior to surgery. ALLERGY WARNING: Do not take with sensitivities/allergies to fish or iodine. INTERACTION WARNING: May interact with some prescription drugs such as blood thinners.